On departing the RNC in Tampa yesterday, Ron Paul, his wife and grand-daughter were subjected to harassment by the TSA at a small airport in Clearwater, Florida. Eight TSA goons told the Paul entourage they would need to be screened before they would be allowed to leave because Mitt Romney might be nearby. The insinuation was obvious — Paul and his family pose a threat to the GOP presidential candidate. 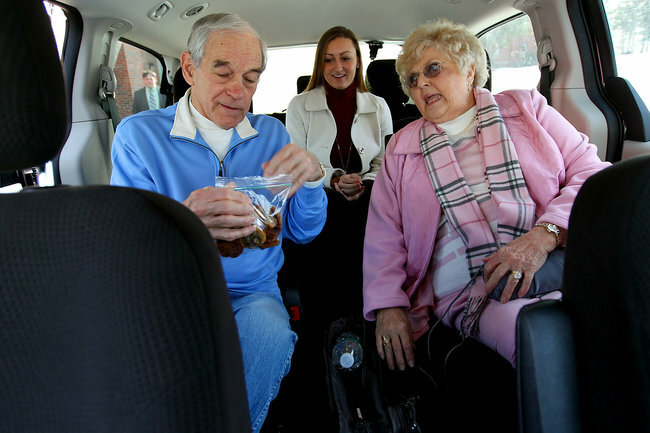 After a protracted examination of Ron Paul’s credentials, the agents demanded they be allowed to check the airplane for explosives. The incident ended after Ron Paul’s wife, Carol, who has a pacemaker, refused to be screened by the TSA and an aide started taking video. The disgraceful incident serves as a vicious parting shot by the establishment. The GOP has consistently sabotaged Paul’s campaign and the corporate media has either ignored the candidate or portrayed him as a radical that had absolutely no chance of winning the nomination despite his huge and unprecedented following and popularity with the American people. In March, we posted details from a report by an investigative journalist who documented efforts by GOP insiders to sabotage Paul’s campaign and thwart his supporters in the primaries and during the convention. The establishment media worked in concert with the GOP and refused to report that Paul had won the five state minimum required to be on the ballot for nomination at the Republican Convention. In addition to revealing the lengths the establishment and its lapdog media will go to harass and discredit a candidate they consider dangerously unacceptable, the incident underscores the determination of the TSA to move into smaller airports despite an effort earlier this year by Republican lawmakers to expedite the implementation of a program that would allow airports to opt out of federal security screening. Ron Paul’s son, Rand, a Senator from Kentucky, was detained earlier this year by the TSA in Nashville. Following the incident, Rand issued a press release in which he vowed to lead the charge to “end the TSA” and put a stop to the needless and humiliating groping of toddlers and grandmothers. In 2010, the elder Paul told Alex Jones that he was also molested by the TSA. During an interview with CNN, he said the TSA traps Americans into subjecting to the humiliating intrusive procedure at airports. “It doesn’t make us safe. It undermines our liberties and there’s a much better way of giving us security at the airports than accepting the bureaucrats and the politicians in Washington. That is totally unacceptable from my viewpoint.” Paul said. In 2010, Paul introduced the American Traveler Dignity Act to shield Americans from the abuses of the TSA.